Union Station, one of the Commonwealth's most beautiful structures, underwent a magnificent restoration in 1998-1999. 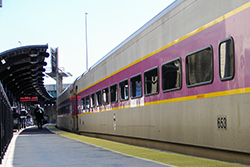 Today it serves as an inter-modal hub, hosting Amtrak, Massachusetts Bay Transportation Authority commuter rail service to Boston, taxi service, as well as both intra- and inter-City bus services and free Wi-Fi access. Grab a bus or coach at the Union Station terminal to travel outside the City, or catch a WRTA bus at the WRTA Hub nextdoor to travel to nearby destinations. 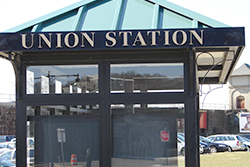 Union Station lies on the Providence & Worcester Railroad and offers residents and visitors the opportunity to travel near and far. 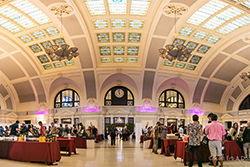 In addition to being a major transportation hub for Central Massachusetts, Union Station often hosts public and private functions and events. Maxwell Silverman's Banquet & Conference Center manages events in the Grand Hall and occupies a restaurant and lounge area on the first floor. Call 508-755-6408 for information about function rentals. Additionally, the Worcester Redevelopment Authority provides free use of Union Station's public space to the disability community, up to three (3) dates per year, for fundraising events. Please contact the Disabilities Division for more information. 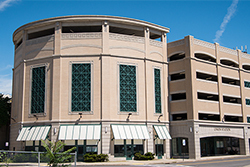 Behind Union Station lies a 500-space parking garage, giving commuters and visitors a convenient means of parking directly next to this transportation hub. The overall structure and design of the garage is the perfect complement to the historical architecture of this beautifully restored building.